Any unprotected piece of wood left in the outdoors will show signs of deterioration within a year or so. It's in Nature's character to bear down on materials that have become inanimate -- and that includes pieces of lumber forming your deck or fence. In this case, sunlight and rain are her main tools. Wood exposed to sunlight out in the open turns weak and gray as the rays of the sun ruptures its internal fibers. A similar breakdown takes place when rain water soaks wood and makes it swell. The result is sponginess. Morning dew and afternoon sun then set a daily wood swell-shrink cycle in motion, hastening the deterioration process. Grayed surface, deformation, splitting, and loosened nails are telltale signs of wood trouble for which the elements are responsible. 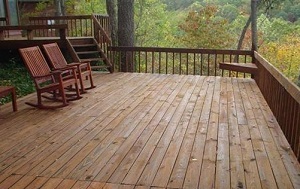 TaskMasters offers a full service, highly skilled Rutherfordton deck resoration contractors, that have been trained to perform work safely, professionally, and with regard to customer satisfaction. If you're looking for a professional deck cleaning contractor in Rutherfordton, then give us a call 252-266-9457 or complete our online request form.